Ford Racing announced this morning that the Motor Company is getting back into endurance racing with their tried and true EcoBoost V6 – with a planned debut of the EcoBoost’d Daytona Prototype race car at January’s Rolex 24 at Daytona International Speedway. Ford has done a great many things with their EcoBoost technology but on January 25th and 26th 2014, Ford Racing will introduce their popular EcoBoost V6 motor to the world of endurance racing in the TUDOR United SportsCar Championship. The Michael Shank Racing team is the first to announce plans to run the new EcoBoost race engine in their Daytona Prototype race car. The motors used by Michael Shank Racing will be built by Roush Yates Racing Engines – the same group responsible for Ford Racing NASCAR engines. 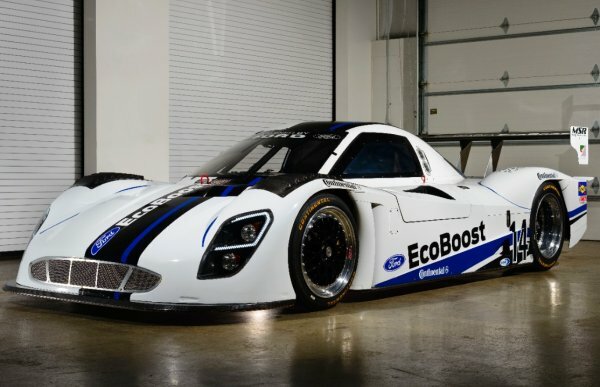 In addition to the new EcoBoost race engine debuting in the MSR Daytona Prototype car, Riley Technologies will debut a new race car featuring a Ford Racing theme and powered by the Ford Racing EcoBoost race engine. This car will not be participating in the racing action but it will be on display as Riley Technologies looks to gain approval based on the pending aerodynamic allowances set for by the United SportsCar Championship management. If the name Riley Technologies sounds familiar, it probably should if you follow endurance racing as Riley is responsible for the current SRT Viper race teams competing in the American LeMans Series. Riley Technologies is also preparing the SRT Viper GT3-R that will compete at the Rolex 24 at Daytona in a different class than the EcoBoost powered MSR race cars. The MSR Daytona Prototype packing EcoBoost power will actually make its track debut at Daytona International Speedway on October 9th 2013 as driver Colin Braun looks to break the average lap speed record of 210.364. That record was set back in February 1987 as Bill Elliot took his Coors sponsored Ford Thunderbird around the track for a record that has stood for over 26 years. That run at the Daytona International Speedway where the EcoBoost Daytona Prototype car will try to knock off Bill Elliot’s record run from 1987 is scheduled to begin at 8am on October 9th. You can be sure to find the results as soon as Ford Racing announces whether or not the MSR Daytona Prototype racer packing the 3.5L EcoBoost V6 breaks the 26 year old NASCAR record. With Ford announcing their departure from the NHRA, we can expect that the Blue Oval will appear in other forms of auto racing and with the growing popularity of the world of endurance racing – this seems like a smart move by Ford. While putting their logo and the EcoBoost name on a racecar, this will also further Ford’s efforts to show that EcoBoost technology really can do anything as the EcoBoost in the Daytona Prototype class will be competing mostly with V8 powered racecars.